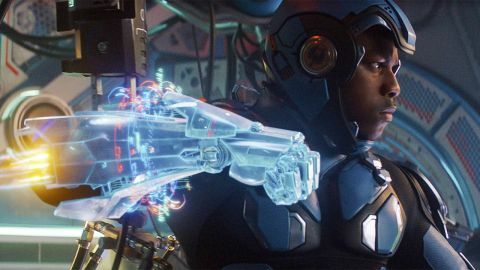 Pacific Rim Uprising review: "Boyega adds real bounce and DeKnight delivers spectacle"
Respectable. Boyega adds real bounce and DeKnight delivers spectacle, even if the plot doesn’t strain too far from the original’s crash-bang formula. “I am not my father.” With those words, Jake Pentecost (John Boyega) lets us know that this Pacific Rim is cut differently to its 2013 predecessor. Introduced ten years after the human-controlled Jaeger robots defeated the threat of the Kaiju monsters from the deep, Jake is far removed from his pilot father, Stacker, who sacrificed himself to save mankind. When Jake isn’t partying, he’s scavenging for Kaiju tech to sell on the black market. Running into young wannabe Amara (Cailee Spaeny), Jake gets arrested for being in her “unregistered”, self-designed Jaeger, ‘Scrapper’. Offered prison or the task of tutoring young pilots at his old academy, he takes the second option and butts heads with square-jawed Nate (Scott Eastwood), who only wants Jake to realise his lost potential. When a Jaeger goes rogue, however, it sets in motion a chain of events that force Jake to step up to the plate. Fans of the original will be pleased with the way surviving characters – Jake’s “half-sister” Mako Mori (Rinko Kikuchi) and the two boffins Dr Newton Geiszler (Charlie Day) and Dr Hermann Gottlieb (Burn Gorman) – are woven back into a globe-trotting story. Destinations include Shanghai and Tokyo, where fantastic scenes of city-wide destruction leave you pining to watch a classic Godzilla outing. Director Steven S DeKnight, a helmer on Marvel TV’s Daredevil, deserves credit for holding back on all-out carnage until the finale. Unlike Transformers’ Michael Bay, he shows a modicum of restraint, with the sight of the rogue Jaeger brandishing two giant, chainsaw-like weapons offering thrills enough. You might be thinking: hang on, where are the Kaiju? To reveal too much would spoil the secrets, but fear not: the threat hasn’t gone away. Less effective are the scenes of the adolescent pilots under Jake and Nate’s tutelage. The squabbling between Amara and blonde-haired Vik (Ivanna Sakhno), irked that this upstart has joined the corps merely for designing her own Jaeger, gets a little tedious. Somewhat derivative also is Lorne Balfe’s score, with its ominous synth sounds reminiscent of Daft Punk’s masterful music for Tron: Legacy. Fortunately, Boyega injects vitality into the film, whether he’s chowing down on ice cream and sprinkles in the commissary or giving a rousing speech reminiscent of Idris Elba’s Stacker in the first movie. Also impressive is Chinese actress Tian Jing, cast as the no-nonsense Liwen Shao, whose company is looking to - controversially – introduce remote-controlled ‘drone’ Jaegers. While the age-old theme of being your own person – “It doesn’t matter who your parents are” – is hammered home, DeKnight ensures it doesn’t overstay its welcome. Boyega’s Jake even hints at a third outing in the finale. Clearly, this war ain’t over yet.